Cristiano Ronaldo endured a frustrating and action-packed Serie A debut as Juventus scrambled to a 3-2 win at Chievo. 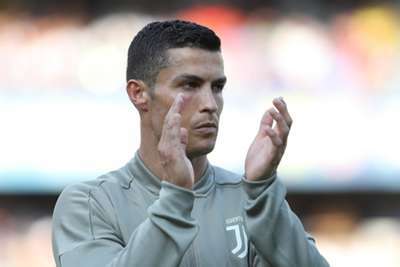 Ronaldo started for the champions on Saturday but could not find a way to beat inspired home goalkeeper Stefano Sorrentino, who was injured in a late collision with the forward. Chievo came from behind after Sami Khedira's early opener for Massimiliano Allegri's side, but Mattia Bani's own goal levelled the scores and Federico Bernardeschi tucked in an injury-time winner for the champions. Here, Omnisport details Ronaldo's first competitive appearance for the Serie A champions in minute-by-minute detail. 3 - Juve take the lead through Khedira, but Ronaldo is not involved in the goal. 5 - Ronaldo, playing as the main striker, twice drops close to the halfway line to link up play in the Juve midfield. 18 - Juan Cuadrado plays Ronaldo through on goal but he drills his shot narrowly wide. 30 - Set up by Cuadrado again, this time Ronaldo volleys well off target but the chance was tough. 38 - Against the run of play at the Bentegodi, Chievo level through a fine Mariusz Stepinski header. 48 - Ronaldo's first shot on target in Serie A comes from long range, but Sorrentino makes the save. 56 - Chievo upset the script again - Emanuele Giaccherini converts a penalty he won himself. 61 - A Bonucci cross finds Ronaldo in the box, the forward picks out Sorrentino with his header though. 66 - Ronaldo jinks into space in the left channel and unleashes a shot on goal, which Sorrentino saves brilliantly. 69 - It's all Ronaldo now but a deflected shot from the Portugal captain lands on the roof of the net. 71 - Ronaldo drifts out to the left and delivers a fine cross that substitute Mario Mandzukic flicks wide. 75 - Juve level, with Bani nodding the ball home under pressure from Leonardo Bonucci from a corner. 77 - Ronaldo wins a free-kick and drills it at goal, but again Sorrentino is equal to the effort. 86 - High drama as Juve seemingly score an equaliser through Mandzukic, but Ronaldo is penalised after handling the ball and inadvertently knocking Sorrentino out cold with his knee. 93 - Juve net the winner, Bernardeschi prodding in an Alex Sandro cross from close range. FT - Three points for Juve, with Ronaldo grimacing at the end of a tough encounter in Verona.